As weADAPT approaches a second decade at the forefront of climate change adaptation knowledge brokering work, it is expanding on its mission with the launch of a website service to help people better connect, share and learn from one another about adaptation issues. The new weADAPT service creates bespoke, independently branded sites with unique URLs for projects addressing climate change. These individualised, customisable websites will be able to take advantage of the technology, visibility, member community, social media channels and extensive links established by weADAPT over its 10-year history of development and outreach. The aim is to provide a cost-effective service for climate change researchers and practitioners. The new service provides new projects with a way to jumpstart their visibility on the web, and established projects a way to ensure their knowledge legacy, by seeing to it that access to information generated will outlast any given project or circumstances. Moreover, weADAPT provides the technological underpinnings that allow these projects to benefit from its established networks, existing content and expertise. From its inception in 2007, weADAPT has sought to address “knowledge fragmentation” – a growing problem in a world in which we are all so inundated with information that we often cannot find – or cannot spend the time to find - what we are seeking. People need tools to help them find the information they need, and to distinguish information from misinformation. Reports, videos, case studies, webinar recordings, presentations, training materials and all manner of knowledge resources can languish in obscurity on individual project and organisation websites familiar only to a select group of people. Worse still, knowledge can be lost altogether when projects end, host websites cease, or new projects surface and eclipse previous projects. These circumstances hamper efforts to learn from and build on previous knowledge - an important part of a project’s aim to have long-term impact and to establish a legacy. The inaugural partner in our endeavour is the Ouranos Consortium in Montréal, a non-profit organisation that aims to provide Québec and the rest of Canada with expertise in both climate science and adaptation strategies. Powered by our new service and the weADAPT platform, Ouranos developed a website with an interactive, web-accessible database that pools and disseminates information on energy sector adaptation. Resulting from its project, “Adaptation Case Studies in the Energy Sector – Overcoming Barriers to Adaptation” the new site “Energy Adaptation Map” will eventually include information from roughly 200 case studies. It provides a self-reporting interface to allow users to post additional energy adaptation examples, thereby keeping the knowledge base relevant and up-to-date. Both, the initial study and the development of the web site were supported by Natural Resources Canada (NRCan) through its Adaptation Platform Energy Working Group. The key benefit for this new partner site, beyond access to the existing technology that weADAPT provides, is its automated links to existing content on climate adaptation, and to a growing community of researchers, practitioners and policy makers. “At Ouranos, we had collected energy sector adaptation case studies from around the world and wanted to make this database available online. 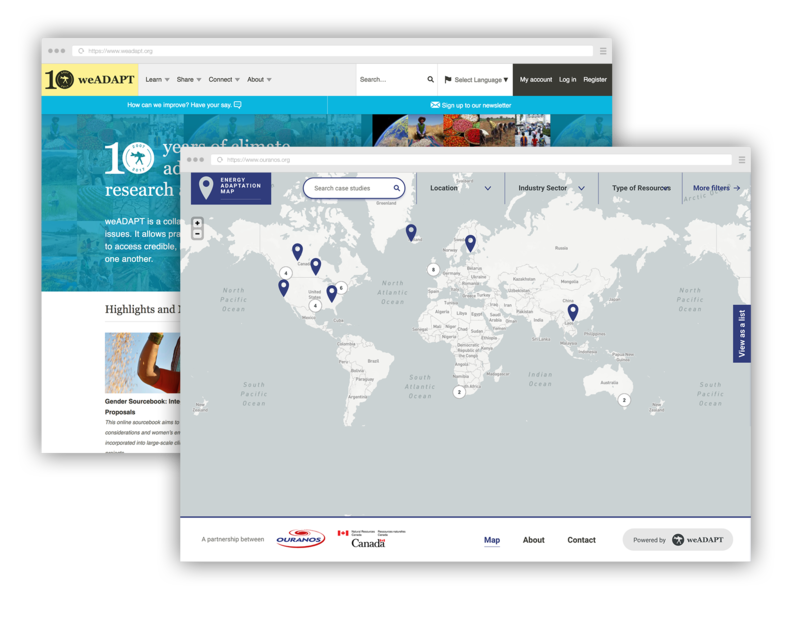 Instead of re-inventing the wheel and setting up yet another climate change adaptation web site, we found that the intuitive and simple map interface of weADAPT was a perfect match to what we had imagined. Merging our collection of energy sector adaptation examples with the weADAPT platform was a logical step. While we can present our sector specific case studies separately and control the appearance, we benefit from a great existing infrastructure, an interconnected user community, high visibility and a great team behind the platform to rely on. - Marco Braun, climate scientist at Ouranos, a non-profit consortium supported by its members in government, industry and academia. By building on top of existing technology weADAPT partner sites offer a cost-effective option for developing fully branded project websites that fulfil donor requirements. But at a fraction of the cost of developing an independent site from scratch. The linked websites will appear as fully independent sites with independent URLs and customised website design. The partner sites will encompass all the features you see on weADAPT, including the discussion forums, commenting features, user profiles, interactive maps and easy-to-use data entry templates for sharing information developed based on user needs, as well as the ability to take advantage of several active social media channels (Twitter, Facebook, LinkedIn and Google+). The partner sites will use the same keyword tagging system used on weADAPT to empower users to search for and find relevant knowledge from across multiple platforms. This tagging technology is being continually developed and updated by the Renewable Energy and Energy Efficiency Partnership (REEEP) as part of their Linked Open Data activities. This is also supported by collaboration with SEI, weADAPT and the Climate Knowledge Brokers community and is one example of how we are constantly future-proofing weADAPT and its links to associated platforms in a world of mass data availability. This tagging functionality means that content on the partner sites appears in searches on weADAPT and in the weADAPT newsfeed, providing immediate visibility of project outputs to weADAPT’s 4150+ registered members (as of 1st July 2017) and 120,000 annual unique site visitors (2015-2016 analytics). Partner website owners will retain easy-to-use editing control of their website. weADAPT partner sites can take advantage of working with top website developers who have extensive experience in designing and developing inspiring online spaces that meet user needs. They also have the opportunity, if requested, to work with the weADAPT team, on related knowledge-management issues. To register your interest in this service, ask questions, or find out more, please get in touch here. “For the past 10 years weADAPT has strived to further climate change adaptation efforts through supporting knowledge sharing amongst the adaptation community and better connecting users with the information that they need.